Dancing Girls of the Cariboo, Newman/Wright Theatre Co.
To Those Left Behind, Newman/Wright Theatre Co.
Whisky Dealers and Miners Angels, Newman/Wright Theatre Co. I never really set out to be a record producer. When I was doing my first album at Thunder Sound in Toronto, Phil Sheridan offered to show me how the gear worked. That was 35 years ago and I've been recording and producing music for myself and other artists ever since. When I started Woodshed Records in the mid Seventies, I produced just about all of our releases, including LP's by Willie P. Bennett, Cathy Fink and Duck Donald, the Original Sloth Band and lots of others. When I moved to Hamilton to be with Milena, I started working with the Lanois brothers, Danny and Bob, first in their mother's basement and then in their studio on Grant Avenue. 1978 was a big year in that era; I produced my instrumental LP, Sequence, and 7 albums for other artists. I had the wonderful fortune to work with Willie P. Bennett and the Lanois brothers on his classic album, Blackie and the Rodeo Kings; I believe it's still one of the finest Canadian roots albums ever. During all those years in Ontario, I worked in lots of different studios with some great engineers and artists. 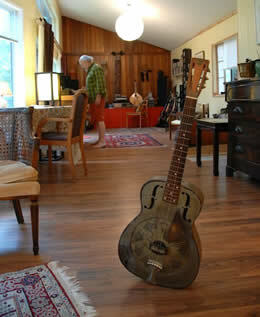 When we moved to the West Coast in 1991, we started renting gear and recording in our house on Thetis Island. 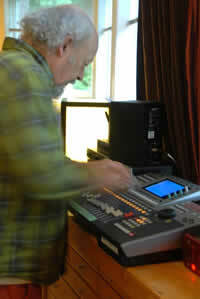 Finally, in 2001 we were able to purchase the gear to have a studio set up all the time in our house on Thetis. The island was quiet and tranquil and our living room had a cathedral ceiling, so we were able to get good sounds with a minimal amount of room treatment. 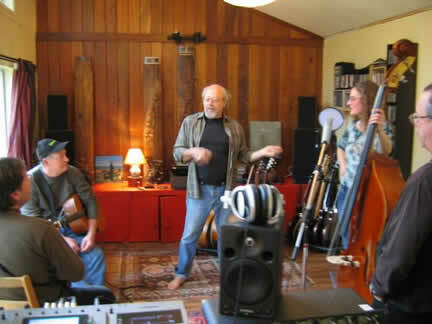 We began to invite other artists to come and record and thus the Watershed Studio came into being. It became a sort of "boutique" studio for some of our singer/songwriter friends who enjoyed the relaxing style of recording in our island house... lay down a few tracks... walk down to the beach... lay down some more tracks... go for a paddle in our kayaks... record another tune... no control room, per se... just everyone together in our living room, making music and recording. Now we've moved to Protection Island, near Nanaimo, BC, and Watershed continues, with artists coming and spending time here, recording and mixing their CD projects in our new island home. The Protection house also has high ceilings and a nice view of the water and we're continuing to get great sound without that off-putting "technical vibe" of a commercial recording studio. The technical heart of the studio is a YAMAHA 16-track digital hard-drive recorder which continues to amaze us with its fine sound and ease of operation. We've complemented the recorder with the big WAVES plug-in and a bunch of great mics and preamps. For the "gold channel" (where we do most of the vocals) we've scored a BLUE Baby Bottle, an a matched pair of Rode K-2 Tube mics which have become the mascots of the studio - run those little sweethearts through our AVALON 737 preamp and everyone sounds like Emmy Lou! In addition to my own album projects, we've also produced and recorded CDs for an amazing cornucopia of singer/songwriters including: Frank Hoorn, the late Ted Turner, Peter Haines, Richard Broadbent, Raghu Lokanathan, Deb Maike, Allison Brown, Gary Brewer, Sall Gibson, Teach Yourself Piano, and Craig Elder. On nearly all these recordings, we've invited our dear friend and near-resident musician, Tobin Frank to join us on acoustic bass, accordion and piano. His brilliant bass playing has become a big part of the "Watershed sound", and we're always grateful for his artistry in our studio. So the little studio that was never planned to be, continues to hum along with lots of exciting projects. Our production style has always been to demystify the process as much as possible, to keep it simple and to concentrate on good live performances off the floor, rather than relying on technical wizardry to clean things up later. As our old friend and fellow producer Paul Mills says, "if it's not off the floor, it's not in the store; you really can't fix it in the mix." We strive to provide our artists with a relaxed, yet focused, working environment where the music comes first... and "the knobs" are all there in the background to capture the magic of people making music together. We once asked the great Nashville producer Jim Rooney the secret of his brilliant production style. He replied, "I just try to stay out of the way."